The goal of this series is to articulate a theology for progressive Christianity that is energetic and has popular appeal. To this point I've made two big observations. First, I believe the energy and appeal for a progressive Christian vision comes when we recover a warfare theology, a theology of revolt grounded in the biblical witness. People want a real fight and a warfare theology gives them that. Second, as I argued in the last post a warfare theology presupposes a weak God, presupposes limitations on God's power and control in the world. This is the interesting connection--warfare and weakness--between books like Greg Boyd's God at War and John Caputo's The Weakness of God. It's a connection not many have noticed because readers have tended to focus on Boyd's answers rather than upon the question he's trying to answer. Specifically, a warfare theology presupposes that evil is renegade, outside of God's control. This view extracts God from the evil in the world, placing evil outside of God's sphere of influence. When this happens evil is no longer a theological puzzle ("Why does God allow bad things to happen to good people? ), but a force to be opposed. To get to this point you need to let limits on God's power in the world. Boyd does this by appealing to free will. For a variety of reasons I don't think that works, but I agree with the goal of the free will appeal: for a warfare theology to work you need a weaker God. 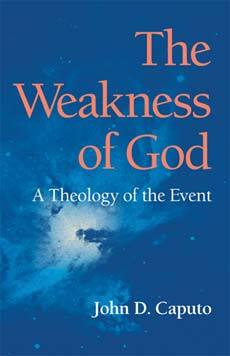 And it's here where we can now turn to John Caputo's book The Weakness of God. The crux of what I want to argue in this post is this: If we need a weaker God to extract God from evil and create a warfare theology, why speculate indirectly about the volitional capacities of angelic beings (e.g., that demons have free will) when we can posit the weakness of God more directly? To be sure, conservative Christians won't want to go in this direction--toward the weakness of God--but we don't care about conservatives right now. We are sketching out a progressive theological vision. And many progressive and liberal Christians are already on board with visions like Caputo's in The Weakness of God. So I don't need to convince them of this view. All I need to do is show the connection between the weakness of God and the warfare worldview as described in Boyd's God at War. Because, let's be honest, Caputo's The Weakness of God doesn't have broad popular appeal. It's too steeped in post-modern deconstruction and Continental philosophy to energize a congregation of Christians. Basically, if you're talking about Derrida or Lacan you're screwed, pastorally speaking. Again, people want a real fight. They don't want a lot of post-modern philosophication. And so that I might practice what I preach, let's not start with Caputo in talking about the weakness of God. Let's start with the bible. Where is the wise person? Where is the teacher of the law? Where is the philosopher of this age? Has not God made foolish the wisdom of the world? For since in the wisdom of God the world through its wisdom did not know him, God was pleased through the foolishness of what was preached to save those who believe. Jews demand signs and Greeks look for wisdom, but we preach Christ crucified: a stumbling block to Jews and foolishness to Gentiles, but to those whom God has called, both Jews and Greeks, Christ the power of God and the wisdom of God. The power of God is here associated with things that are foolish, weak, lowly and despised. This is the power/weakness of God in the world, the power manifested on the cross. In short, the power of God in the world is the power of the cross. The power of weakness, powerlessness, and lowliness. The power/weakness of God is manifest in "being made nothing" in the world. The power/weakness of God is found in failure, loss, and humiliation. “You know that those who are regarded as rulers of the Gentiles lord it over them, and their high officials exercise authority over them. Not so with you. "I am among you as the one who serves." Dear friends, let us love one another, for love comes from God. Everyone who loves has been born of God and knows God. Whoever does not love does not know God, because God is love...Dear friends, since God so loved us, we also ought to love one another. No one has ever seen God; but if we love one another, God lives in us and his love is made complete in us. Love is the power/weakness of God in the world. If you love you have been "born of God." If you love you "know God." If you love God "lives in" you. Surrounded by so much power, it is very difficult to avoid surrendering to the temptation to seek power like everyone else. But the mystery of our ministry is that we are called to serve not with our power but with our powerlessness. It is through powerlessness that we can enter into solidarity with our fellow human beings, form a community with the weak, and thus reveal the healing, guiding, and sustaining mercy of God...As followers of Christ, we are sent into the world naked, vulnerable, and weak, and thus we can reach our fellow human beings in their pain and agony and reveal to them the power of God's love and empower them with the power of God's Spirit. Okay, so far, so good. All of this material from the bible is well-trodden territory, and while some of my formulations above might be too strong for some conservatives most of these texts and the takeaway points I've made are generally agreed upon by both progressives and conservatives. God is the source of good and its warrant. That is the stamp or the seal that God puts on creation; that is God's covenant with us. But God is not the power supply for everything that happens. At this point, most conservatives will balk. That is, while they make accept, on one level, the cross of Jesus and the path of servanthood, they don't think the power of God is limited to those things. Behind the cross, they would contend, is power and awesome force, a power and force that can push people around, can push the entire cosmos around, can with the snap of a finger obliterate anything and anyone. God is more than weakness, God is power. Awesome power. But in his book The Weakness of God Caputo rejects all that. Beyond the cross there isn't a reservoir of awesome force. The power of God just is the weakness of the cross. The cross exhausts what we mean by "the power of God," with no remainder. As Bonhoeffer says, God is weak and powerless in the world, and that is precisely the way, the only way, in which God is with us and helps us. Key those words, "the only way." In this view there is no other power but powerlessness. No other form of control than weakness. And this is the only way. There is no Big Stick, no Big Power Switch sitting in reserve. The weakness of the cross is the only way God rules the world. The. Only. Way. Another way to say this is to echo a church father (I can't remember who right now) who said, "There is no force in God." The power of God is not pagan violence, brute power, vulgar magic; it is the power of powerlessness, the power of the call, the power of protest that rises up from innocent suffering and calls out against it, the power that says no to unjust suffering, and finally the power to suffer-with (sym-pathos) innocent suffering, which is perhaps the central Christian symbol. On this scheme...the transcendence of "God" does not mean God towers above being as a hyper-being. Rather, God pitches his tent among beings by identifying with everything the world casts out and leaves behind...God withdraws from the world's order of presence, prestige, and sovereignty in order to settle into those pockets of protest and contradiction to the world. God belongs to the air, to the call, to the spirit that inspires and aspires, that breathes justice. God settles into the recesses formed in the world by the little ones, the nothings and nobodies of the world. God chose the "outsiders," the people deprived of power, wealth, education, high birth, high culture. Theirs is a "royalty" of outcasts, so that, from the point of view of the aion, the age or the world, the word kingdom is being used ironically, almost mockingly, to refer to these pockets of the despised that infect and infest the world. For this is a kingdom of the low-down and lowborn, the "excluded," the very people who are precisely the victims of the world's power. In short, most progressive Christians are relating to God, thinking about God, and living as if the metaphysical account described above is the case. So all we are doing is making explicit what has been largely implicit within progressive Christianity. And with that understanding in hand we can now circle back to the warfare theology articulated by Boyd in God at War. Again, we've seen in Boyd how we need a weak God to go to war. That's the only way to extract God from complicity in evil. Evil has to be outside of God's control, an independent force or power outside of God's own. Boyd achieves this limitation of God's power with an appeal to the free will of angelic and human beings. But we've rejected this as an option (at least for many progressive Christians). But we aren't stuck because we have another way to get to the same conclusion: we can posit more directly the weakness of God. Theologically, this gets us what Boyd was after--a weaker God--without positing 1) the existence of angelic beings and 2) that these beings have free will. In short, progressive Christians can get the warfare theology they want by simply making explicit their views regarding the weakness of God. This is the connection between God at War and The Weakness of God. As Boyd argues, a warfare theology assumes a plurality of forces in the world in combat with each other. A weak view of God assumes this plurality, that in the world there are a variety of forces often working at cross-purposes. Among these forces is the "weak force of God," the force of love. And insofar as love abides and "rules" then the Kingdom of God is instantiated. Christ is made "King" and "Lord." And insofar as love is overthrown by force then the Kingdom of Satan holds sway. Waging spiritual warfare, then, is using the tools of Jesus (love, servanthood, self-giving) to establish and expand the Kingdom of God in the face of competing, hostile and evil forces. Spiritual warfare is "binding the strong man" in order to inaugurate, on earth, the Kingdom of Heaven. And yet, other questions remain as this view of the weakness of God challenges traditional views of God's power, particularly the displays of God's power at the start (Creation) and at the end (New Creation) of the biblical narrative. Those two events--creation and new creation--seem to involve a lot of power. How are we to think about those events in light of the weakness of God? The theological detour continues. More to come. Richard, you may lump the following questions in with eastbk's 4th comment, but I am also wondering about the idea of God truly being powerless. How do we understand Jesus' option to call upon the legion of angels? A bluff? And can one "self empty" if they are already at empty? If God is already at empty, can he empty himself further as the incarnation? Finally, this strong view of God's weakness helps progressives see life through a framework of spiritual warfare, but (and I may be missing this part) does it do what Boyd's framework does in giving some sort of answer to the "why" part of theodicy? Boyd's answer to "why" is free will and fallen angels. But can your take on Caputo provide any sort of equivalent? Is the equivalent that God is simply too self-emptied to control the chaos in creation? lowly and appears there without sacrificing its loftiness." Meredith, Anthony (2012-10-12). Gregory of Nyssa (The Early Church Fathers) (p. 81). Taylor and Francis. Kindle Edition. Not all progressives & liberal Christians will be in lockstep with one and other on the nature of power & the exercise of power. I consider myself liberal about more than a few things, mayhap the most salient being my rejection of the doctrines of Original Sin & Penal substitution. I see little difference between them and a Muslim honor killing for an honest mistake (the fall of humankind). I'm sure there are conservatives who will assure me a place of endless burning & torment at day's end for holding that view. Nonetheless, I cannot sign on to Caputo's thesis that evil continues in the world because of a kind of theoretical weakness on the part of the Almighty. I think that God's self restraint of His power better explains why evil is allowed to continue until He does away with it in the final end as written down by John the Revelator.